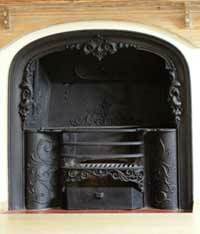 Buying a new cast iron fireplace is a costly purchase but we have a new project on the website which gives help and advice if you are restoring a cast iron fireplace. If you already have an old fireplace in your home you may be thinking about trying to revive it or maybe you are planning to buy an old cast iron fireplace from a reclamation yard to ‘do up’. The project gives advice on stripping and cleaning your fireplace and what to use to get rid of old paint and rust. Depending on the finish you want for your fireplace, you can then decide what sort of product to use on the clened surface – it maybe that you just want to polish it or you may choose to paint it. Whichever you choose, it will be time well spent restoring your cast iron fireplace as they are great features in a house and a good investment!